When you're out shopping, there's a sure-fire way to tell if someone's already tried on that white shirt you're eyeing: It's got streaks of orangey self-tanner on it. 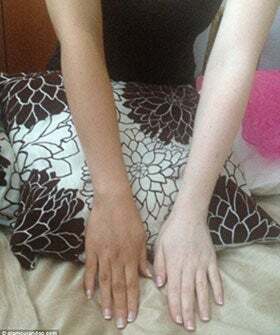 For the women of the U.K. and Ireland, finding a fake tan that delivers fast and semi-permanent results is a challenge. Thankfully, Suzy Boyce of Glamour & Go did a true test of one of the best-selling tanning products in Ireland — with astounding results. Cocoa Brown One Hour Tan is the popular choice in self-tanners over in Ireland, with three bottles sold every minute. And now that the product has launched in the U.K. along with the new Cocoa Brown Night and Day Tan Mousse, Boyce decided to see what all the hype was about. By committing herself to testing one half of her body, she's able to show the mousse's dramatic (and appealing) results. Instructions on the Night and Day bottle suggest applying for a night out on the town, then showering the next morning. With promises to not only hone a brown (not orange!) color and a subsequent five-day glow, we'd be totally skeptical — if it weren't for Boyce's pictures.